Attached is article on “5 Tips To Getting Better Sleep” by Dan Guttenplan published in the Summer 2018 FNF Coaches magazine. Attached is article on “5 Tips To Timing Meals” by Nancy Clark, MD, RD, CCSD published in the Summer 2018 FNF Coaches magazine. Attached is the article from FNFCoaches.com on "6 Tips to Eating For Endurance" by Nancy Clark, Sports Nutritionist. Attached is the new Use and Misuse Opioid of Opioid Drugs Fact Sheet and sign off sheet. Attached is an article from the magazine FNF Coaches – February 2018 edition; Player need to Eat Properly before Competition written by Nancy Clark, Sports Nutritionist. Check out the NFL Films spot on Southern Regional Football which is featured on National Football League website (NFL.com) and soon to be on TV during NFL games and the NFL Network. Attached is an article from the Cleveland Clinic website https://my.clevelandclinic.org/ on “Avoiding Dehydration, Proper Hydration” published on April 5, 2017. Attached is information from the NJSIAA regarding banned substances for the 2017-2018 school year for all student athletes in the State of New Jersey. Attached is information from the New Jersey Department of Health for Hand Foot and Mouth Disease Talking Points for Schools/Childcare released on September 30, 2016. Attached is information from the NJSIAA regarding banned drugs and substances for the 2016-2017 school year for all student athletes in the State of New Jersey. Attached is an article from the 2015 November/December Issue of COACH and Athletic Director Magazine, “Recover in Time…Refueling the body after intense Workouts” bySuzanne Girard Eberle, MS,RD, CCSD from Portland, Oregon. Attached is an article from the 2015 November/December Issue of COACH and Athletic Director Magazine, “Recover in Time…Refueling the body after intense Workouts” bySuzanne Girard Eberle, MS,RD, CCSD from Portland, Oregon. Attached is an article from the 2015 November/December Issue of COACH and Athletic Director Magazine, “Nutrition for the Team Sport Athlete” by Susan Kundrat, MS, RD,CCSD, University of Wisconsin-Milwaukee Nutritional Sciences Program Director. Attached is an article from the 2015 November/December Issue of COACH and Athletic Director Magazine, “The Science of Massage Treatments” by George G.A. Pujalte MD, FACSM from Waycross Georgia. Attached is an article from the November/December 2015 issue of COACH and Athletic Director Magazine “Prep sports hits 7.8 million athletes” from the NFHS Survey. Attached is a fact sheet regarding Heat Related Issues such as dehydration and heat related illnesses for Athletes and how they can be prevented. Attached is a Fact sheet for Parents regarding Sports-Related Eye Injuries and how they can be prevented. Below is information regarding the new NFHS Ice Hockey rules for the 2014-15 season. Also please review video regarding infractions towards dangerous hits. Thank you! Thank you to Atlantic Care Heart Heroes and Dr. Slaven on the grant for an AED machine for Southern Athletics for the 2014-15 school year. 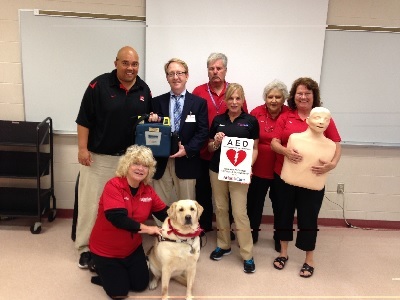 Southern is the 133rd school/organization Atlantic Care Heart Heroes has donated a grant for an AED machine. Attention all Southern Regional School District Football players. Thank you Dr. Papa-Rugino and Southern Ocean Medical Center on the presentation of concussion awareness and baseline testing this evening to Southern Athletics. Attached is the article "Fueling Athletes for Game Day" - Proper hydration & carbohydrate intake is key by Suzanne Girard Eberle in the May/June Issue of Coach Magazine. Attached is the article "Up, Up, & Away" by Amy Culp from the April 2014 Coach Magazine Issue regarding how certain "Superfoods" can help improve athletic performance. Attached is an article published in Coach & Athletic Director Magazine, January 2013 (Volume 82, Number 4) "What you are Missing when it comes to Brain Injuries" by Michael Austin. Attached is a letter from Southern Regional School District Superintendent Craig Henry regarding ImPact Concussion Baseline Screening Test offered by the Southern Ocean Medical Center (SOMC). Also attached are Neurocognitive Screening Facts & the Concussion Consent Form from SOMC. Thank you! Attached is information regarding Breast Cancer Awareness Statistic page. SRHS Athletics supports Breast Cancer Awareness Month (October 2012), “Think Pink”! The following article about injury prevention and performance enhancement was released by Children’s Hospital of Philadelphia – Sports Medicine & Performance Center. Thank you to our school doctor, Dr. Schmoll with providing this information to our athletic department. The following two articles were in Coach Magazine on “Fruits & Vegetables Improve your Athlete’s Output” and “Iron Deficiency in Female Athletes”.